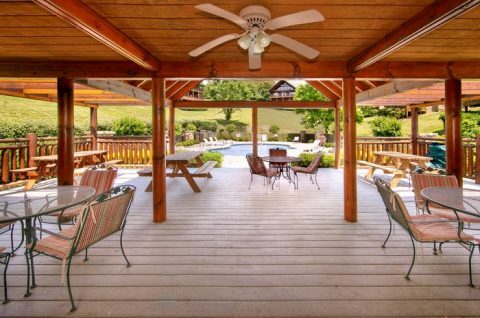 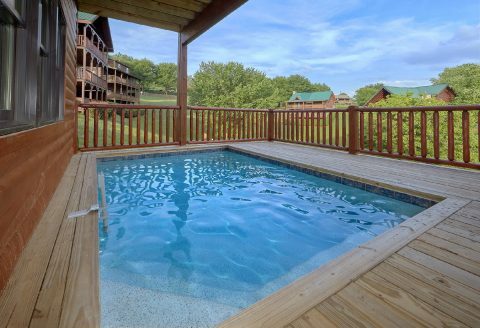 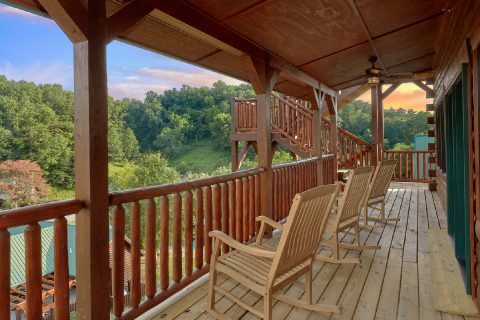 Looking for a 7 bedroom cabin rental in the Smoky Mountains with pool access? 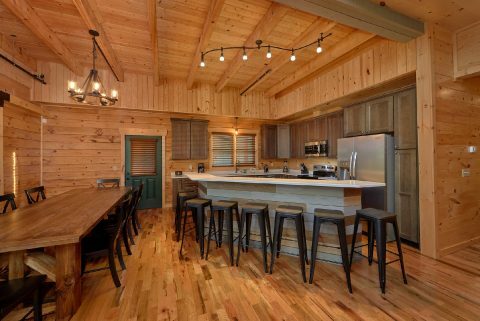 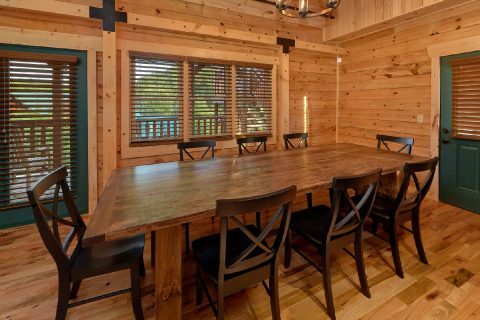 Check out "Poolside Lodge," an impressive large cabin that sleeps up to 19 guests in comfort! 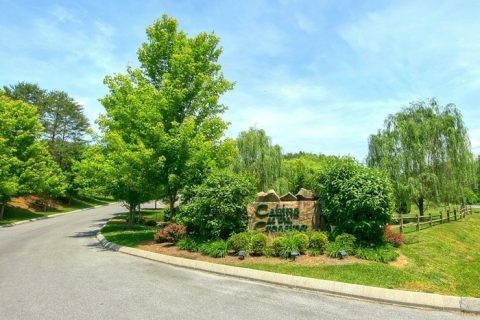 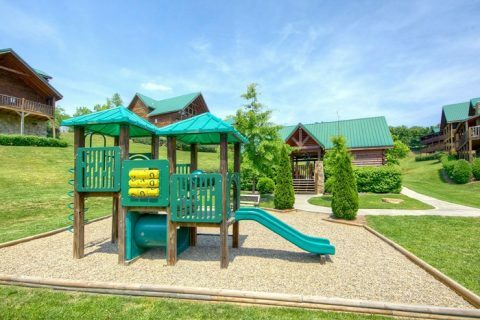 Other nearby highlights like Gatlinburg and the Great Smoky Mountains National Park are also only a short drive away, so you can also easily experience beautiful sights like Cades Cove and Clingman's Dome. 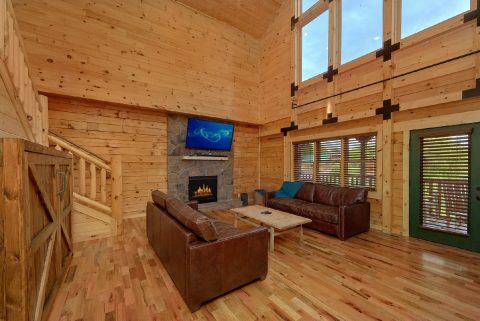 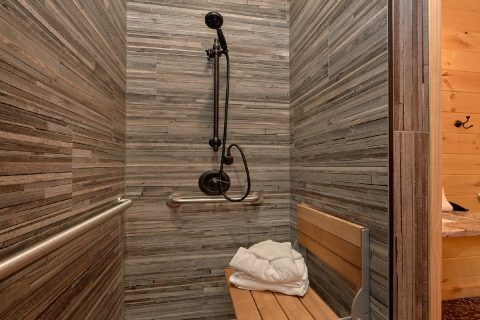 When you aren't busy seeing the best the Smokies can offer, you'll love relaxing in this spacious cabin with plenty of luxurious amenities. 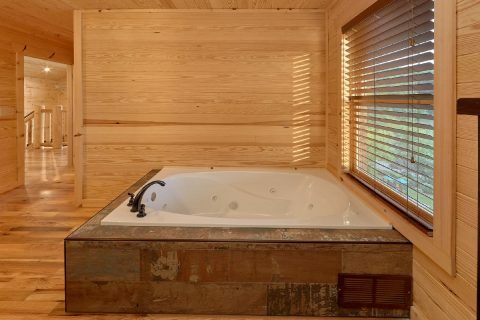 On your cabin's back deck, you can enjoy a private plunge pool for taking a relaxing soak in the fresh mountain air. 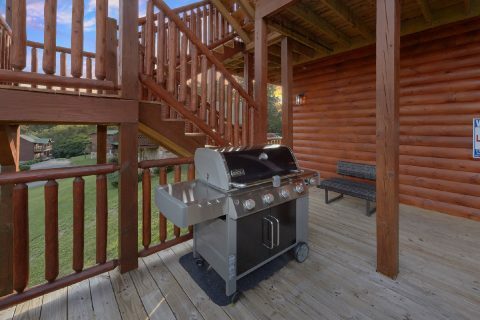 This deck comes complete with a gas fire pit, a gas grill, and a view that overlooks the nearby resort swimming pool. 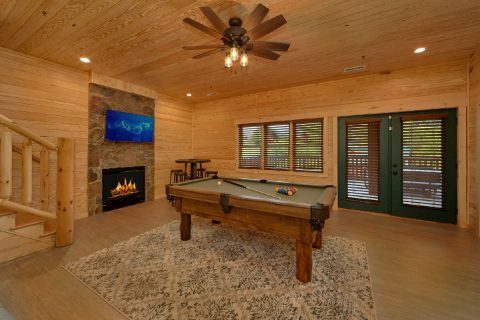 For some indoor entertainment, you can always head downstairs to the lower level game room with a pool table and a cozy gas fireplace. 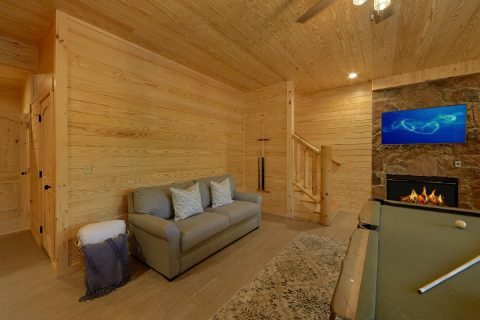 This level is also home to a full theater room, so you can enjoy a laid-back movie night in your cabin in comfort and style. 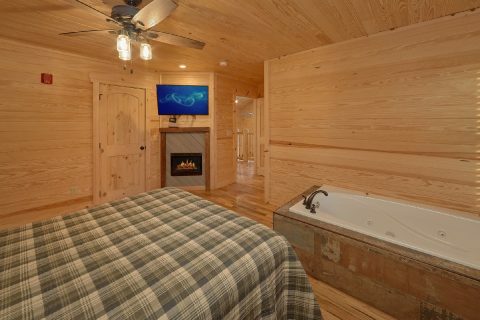 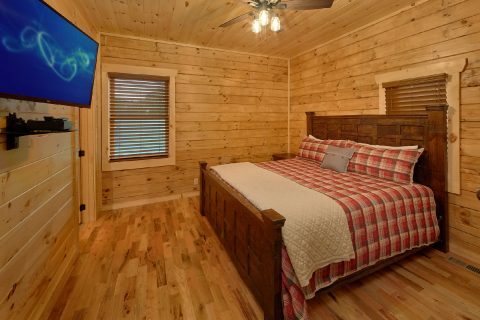 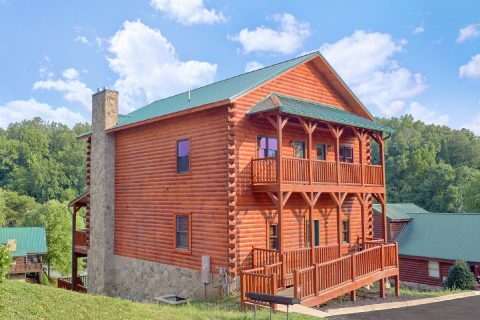 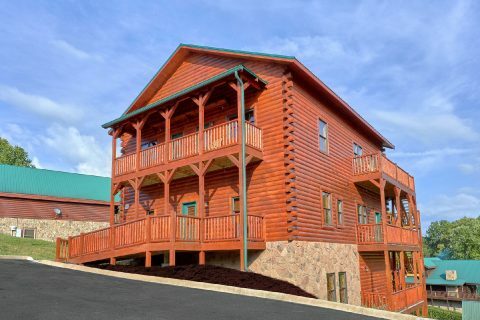 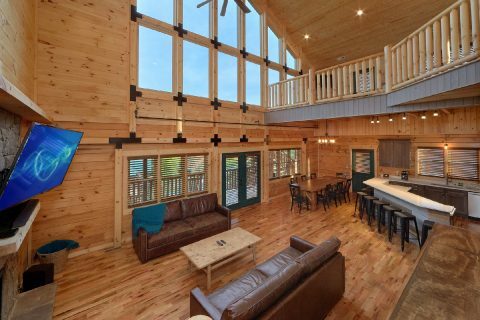 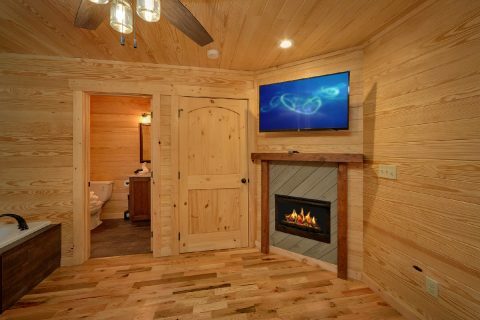 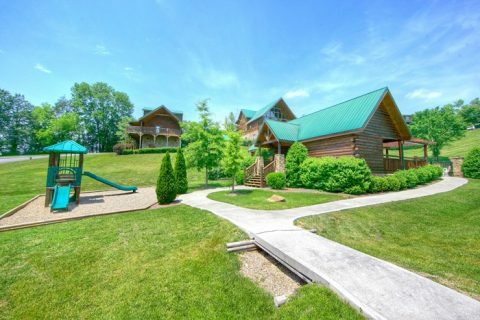 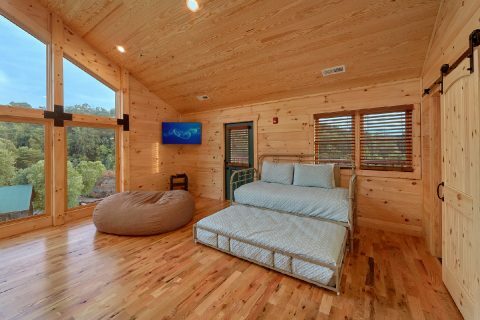 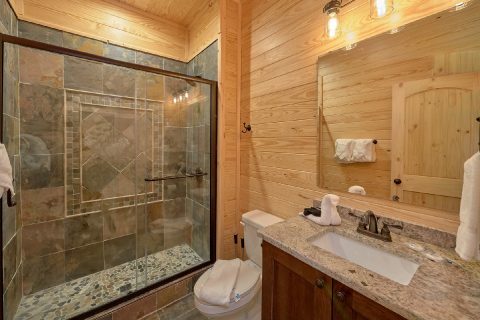 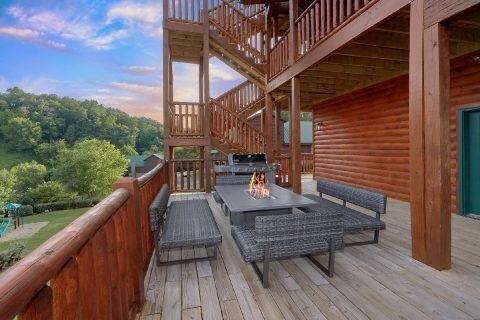 After a great day spent exploring the Smokies or relaxing in your luxurious cabin, you can look forward to getting a good night's rest in one of this cabin's 7 bedrooms. 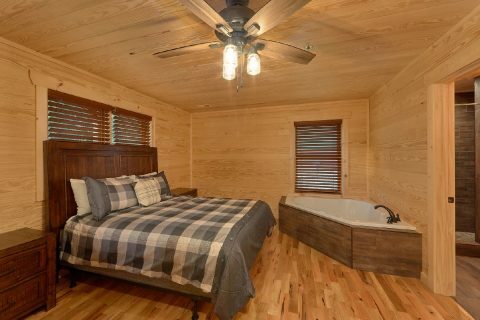 On the main level, there are 2 king-bedrooms complete with private baths. 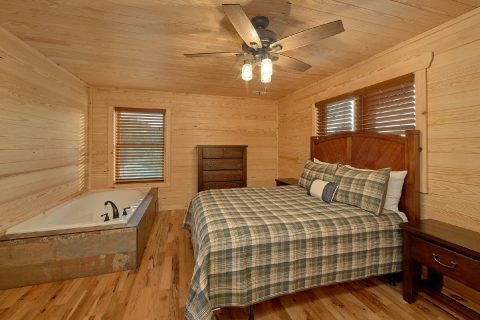 The upper level is home to 2 queen-size bedrooms complete with private jacuzzi tubs. 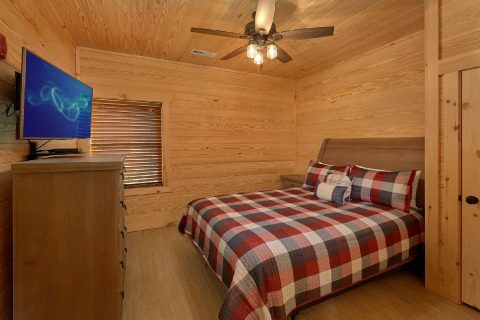 In the loft area, you'll find a trundle bed that can be pulled out to make two twin-size beds. 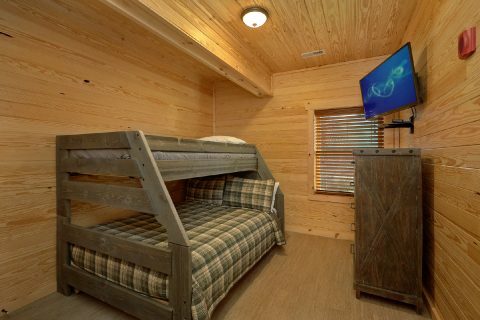 Downstairs, there are 2 more queen bedrooms and another bedroom that offers a twin-over-a-full bunk bed. 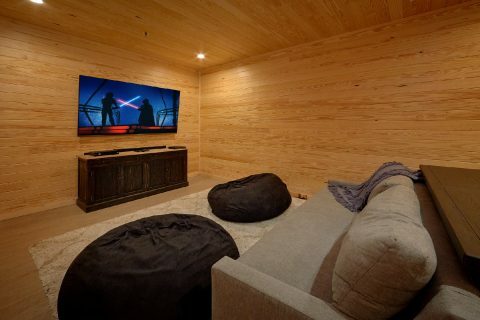 Lastly, the game room features a sofa bed. 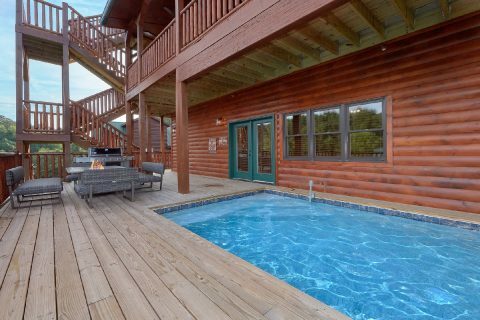 Altogether, "Poolside Lodge" can accommodate up to 19 guests in comfort. 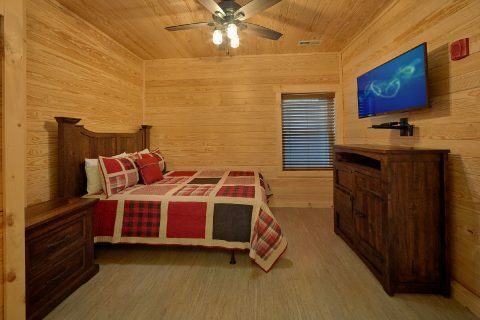 We also offer a nearby cabin called "Poolside Cabin" that can be booked alongside "Poolside Lodge" to accommodate more guests! 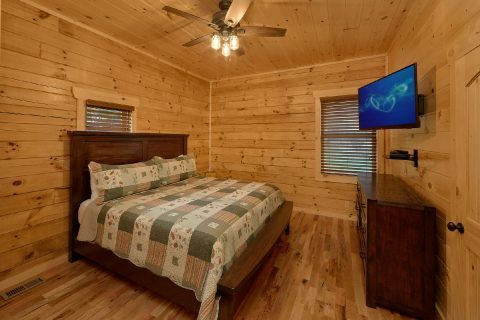 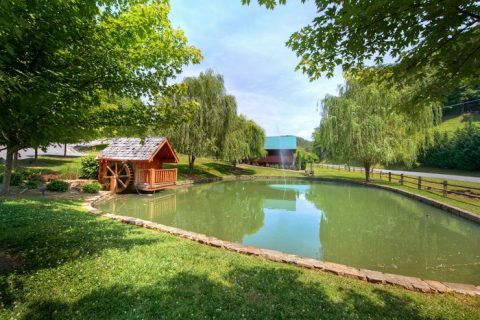 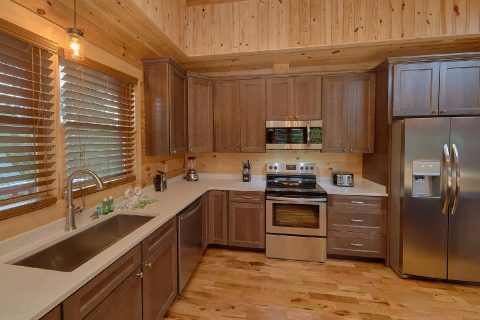 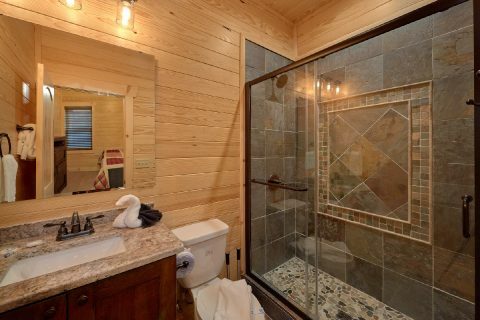 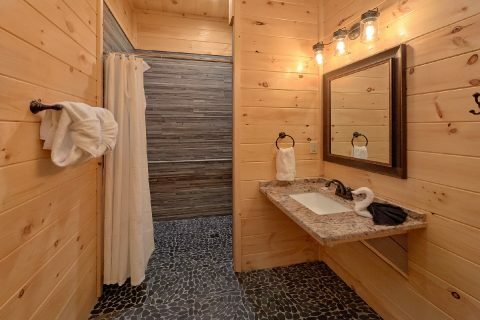 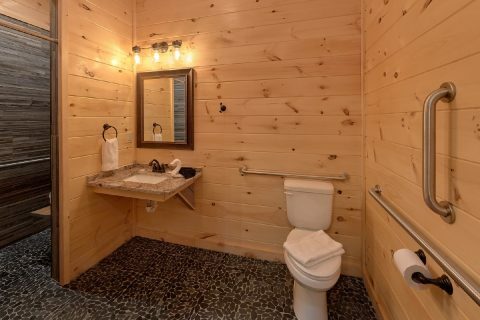 Lastly, this cabin comes complete with useful amenities like a full kitchen, a dining area, WiFi, and a washer/dryer for you to use during your vacation in the Smokies! 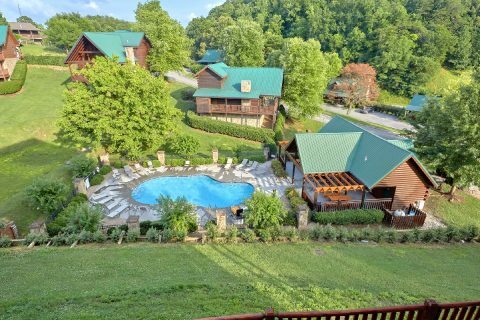 Book "Poolside Lodge" today with Cabins USA Gatlinburg and you'll save 15% on your nightly rate in the Great Smoky Mountains of Tennessee!